When you surf the Web, your life is an open book. Not only can you be tracked by techniques such as cookies, but even your IP address leaves behind digital tracks that can be used to identify you and invade your privacy. If protecting your privacy is important--and you're willing to pay for it--Anonymizer Universal may buy you some peace of mind. At $80 per year, it's not a decision to make on a whim. This screen is the only indication you'll get that you're protected when you use Anonymizer Universal. 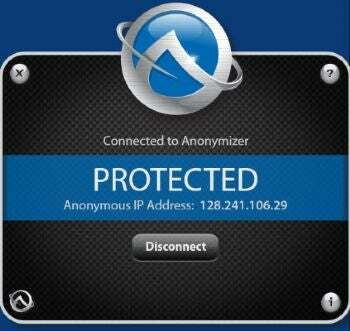 Anonymizer Universal uses Virtual Private Networking technology to keep your IP address private. In addition, it encrypts all of your communications as your data travels across the internet, using L2TP/IPSec, in essence creating a secure, encrypted tunnel for you. It's also useful for those who use public Wi-Fi hot spots and are thus justifiably worried about their privacy. As with your desktop PC, it creates a VPN connection and encrypts all of your communications. Anonymizer Universal has practically no interface. Run the program and click a connect button--and that's it. Apart from a screen that lets you customize whether to launch it at startup, and whether to automatically connect, you won't see anything else--apart from a system tray icon, and a screen that appears when you double-click the icon--telling you if you're connected or not. In fact, that's one of the program's strengths. Run it, connect, and you're protected. So is it worth paying the $80 annual fee for this program? If you're worried about your privacy, and especially if you use public Wi-Fi hot spots a good deal, you may decide that it's worth the cost. It all depends on how safe you believe you are, and what price you put on privacy. There is a free alternative, called Hotspot Shield, but it works only with Wi-Fi, and it delivers ads as it works. You may experience some setup problems with Anonymizer Universal. If you receive an error message that you can't install the software, try installing again, and uncheck the boxes next to Add shortcuts to Desktop and Quick Launch. That might solve your problem. In addition, some firewalls or anti-malware software may not allow Anonymizer Universal to connect. I experienced a conflict between Anonymizer Universal AVG Internet Security and had to temporarily disable AVGIS to work around it.